People who ate healthiest in a new study did so when a grocery store, restaurant, or partner offered up food following THIS formula. 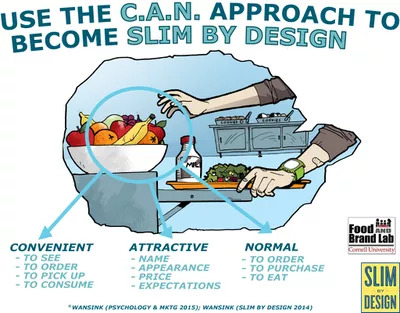 If you're looking to eat healthier, think C.A.N. Not as in willpower, but as in these three critical food musts: Convenient (as in, easy to reach), Attractive (enticingly displayed), and Normal (an obvious choice). That's the conclusion of a recent study from Cornell University, which analyzed 112 studies that gathered information about healthy eating behaviors. People who ate healthiest did so when a grocery store, restaurant, or partner offered up food following this formula. Think about a bowl of fruit displayed on a countertop versus fruit buried in a drawer in your fridge and you get the idea. The study, published in the journal Psychology and Marketing, also offers hints about what to avoid: Watch out for specials at restaurants that have a tempting name, like Creamy Shrimp Fettuccine Alfredo; are highlighted on the menu; and that your waitress is touting. "With these three principles, there are endless changes that can be made to lead people…to eat healthier," promises Brian Wansink, PhD, Director of the Cornell Food and Brand Lab. And they couldn't be easier to remember. As in, you C.A.N. do it.